Ilocos province is located in the far northwest of the Philippines. The province consists of a wide coastal plain rising upwards towards the rugged mountains of the Cordillera Central. These form the backbone of Northern Luzon. The coastal area is intensively cultivated with rice, mango, peanut, maize and tobacco the main crops. The province has two cities, Laoag and Vigan. Bus. Buses are available 24 hours a day. Several bus companies, like Partas and Farinas, have regular trips direct to Laoag City from Manila. Normally, the journey time to Ilocos is around 10-12 hours by day when there is more traffic and 8-10 hours at night. Although it is a long journey, you’ll see a lot of beautiful scenery. If your budget allows, I’d travel on a deluxe bus, many of these have inclined seats, toilet and foot rests. Car. If you enjoy long drives, you can drive to Laoag City from Manila via the MacArthur Highway / Manila North Rd. You can check the route on Google Maps. Air. Cebu Pacific, Philippine Airlines, and Airphil Express have daily scheduled flights to Laoag City. The travel time from Manila is just under an hour. Laoag is the capital of Ilocos Norte and the region’s main offices and universities are located here. 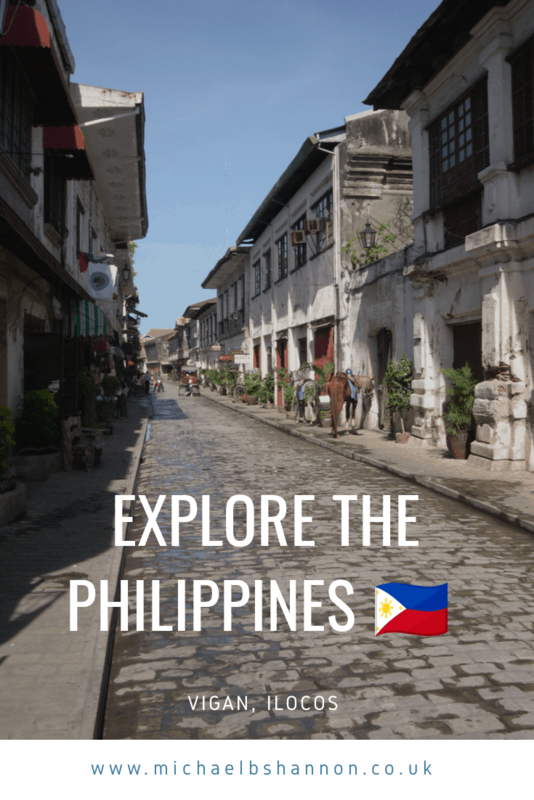 There is not much of note in the town itself, but it is a good place to stay if you want to explore world-famous sites such as Pagudpud, Vigan and Paoay, which are only a short distance away. This tower is Laoag City’s equivalent of Pisa’s leaning tower. Located in the heart of the city this is one of the tallest bell towers in the country (45 m). The tower is very heavy, but it was built on sandy ground. So, the combination of bad foundations and weight is making it sink into the ground at the rate of about an inch every year. The tower is spectacular especially when illuminated at night. Close by is St. William’s Cathedral an iconic church built with old Spanish-influenced architectural styles. The Museum is built in an old warehouse containing collections of historical relics and home interiors from the local area. The museum is perfect if you want to find out more about the region’s culture and history. Before you leave Laoag be sure to try the local food. In particular, make sure you try a delicious Laoag Empanada, a lurid bright orange baked or fried pastry turnover, filled with savory ingredients. Also, try out bagnet (crispy fried pork belly), pinakbet (mixed vegetables in fish or shrimp sauce) and the Laoag longganisa, which is unique for its herb filled and sour taste and is best eaten with a generous amount of sukang iloko (vinegar). This was built as the official residence in Ilocos Norte of the late President Marcos. It is a two-story building located near the legendary Paoay Lake. The residence is complete with bedrooms, a dining area, a kitchen, an office and a spacious ballroom on the second floor. Also, it has a large terrace and a beautiful garden with magnificent views of the lake. The site is about 20 minutes journey from Laoag. Paoay Church (Church of St. Augustine). This is a designated UNESCO world heritage site. Built by Augustinian friars in 1694 using coral bricks, construction was finally completed in 1894. It is a prime example of a Baroque church, and very picturesque. Reminiscent of the Spanish era, it has enormous buttresses on the sides and back of the building. The church is about 45 minutes journey from Laoag. Malacanang of the North, Ilocos, Philippines. Marcos Museum and Mausoleum – Batac. This is just a 30-minute bus ride from Laoag City traveling on any south-bound bus. The museum can easily be found, as it is near the bridge where all the public buses stop. Here you’ll find the Marcos Museum and Mausoleum, supposedly the last resting place of Ferdinand Marcos (1917 – 1989). The Mausoleum is an intensely dark room with a floodlit body in a glass case on a mattress in the centre of the room. Is it real or just a wax fake? I’ll let you decide. No photographs are allowed inside and you cannot get up close to the case. It is really creepy walking around a dark room with eerie choral music playing. The museum itself houses memorabilia of the late President Marcos. The Fort Ilocandia Resort is an old hotel with character. It’s located in Barangay Calayab about 9 km away from the city center. If you want a luxurious stay in the region, then this is the perfect location. Its design was inspired by Spanish colonial architecture. It has a swimming pool, extensive gardens and a private beach with lifeguards. Any number of sports are available including: volleyball, wind surfing, tennis, archery and horseback riding to name but a few. I thoroughly enjoyed a few nights here, look out for special package deals which they offer occasionally. The only let-down is the food which is a bit average. This is located in Badoc, halfway between Vigan and Laoag. It houses the famous Luna family’s memorabilia. Juan Luna was arguably the Philippines’ greatest painter, his most famous work is the Spoliarium which is housed in the National Museum of Fine Arts in Manila. This historic site in the town of Burgos is about 40 km away from Laoag and stands on a hill overlooking the West Philippine Sea. It is the highest Spanish colonial lighthouse in the Philippines. Still active, it provides a welcoming light to ships that enter the Philippine Archipelago from the North. Marcos Museum and Mausoleum, Ilocos, Philippines. Gardens at Fort Ilocandia, Laoag, Philippines. Juan Luna Shrine, nr Laoag, Ilocos, Philippines. Cape Borjeador Lighthouse, Ilocos, Philippines. Travel to the northernmost tip of Luzon to the coastal resort town of Pagudpud and you’ll find crystal clear blue water and white sand beaches lined with coconut trees. At the time of writing this area is relatively unspoilt, where natural beaches can still be found, with little tourism development. If you are looking for a beach where there are not so many people, Saud Beach is the perfect place. There is always a quiet spot where you can sunbathe or go swimming. If you plan to stay overnight, Saud Beach has only a few beach resorts along its coast, so it’s best to book with your resort of choice before going. During summer (March to May), rooms can get booked quickly. The other main beach is the Blue Lagoon beach, which can be found in Maira-Ira Cove. Vigan, established in 1572, is the country’s best preserved Spanish town. The city was located on the Silk Route linking Asia and the Middle East and Europe. It used to be a thriving trading post where gold and other goods were bartered. Today a large part of Vigan consists of a grid of streets lined with Castilian houses. This is the most intact example in Asia of a planned Spanish colonial town. It is such a historically important site that it was designated a UNESCO World Heritage site in December 2000. Motor vehicles are banned from much of this area, so the horse-drawn Kalesa is the main form of transport. Riding a Kalesa is the best way to visit the top tourist spots. A full tour will usually visit around 8-10 different places and take about 3 hours depending on your stay at each location. On your journey you’ll certainly visit some of the following places. Search for Vigan on Google, and chances are that this is the first image shown. This street is right in the heart of Vigan with all the historic buildings that make the town the heritage site that it is. During the day, the street is full of shops selling the best local products of Vigan. This ranges from antiques, woven products and woodcrafts to wine, jewelry and street food. If you can stay until nightfall the streets become quiet and the perfect place for an evening walk. Vigan Cathedral (St Paul Metropolitan Cathedral). This well preserved, lovely old cathedral from the Spanish era is centrally located. 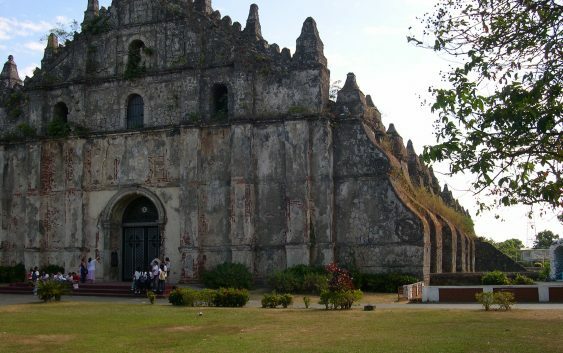 It is typical of old Spanish church architecture of the northern Philippines. The Cathedral is an imposing creamy-white building built in the earthquake baroque style with thick buttresses which are designed to support it through earthquakes and typhoons. It faces Plaza Salcedo on one side and the more lively Plaza Burgos, where locals hang out, on the other. The 25-meter-high bell tower stands 15 meters away from the main building so that if one structure is destroyed in an earthquake, the other will remain standing. Bantay Bell Tower & Church. Also known as the St. Augustine Parish Church. Built by Augustinian Friars in 1590, it is one of the oldest churches in Ilocos. Bantay Church is a baroque-gothic style church with a separate belfry situated on top of a small hill a few meters away from the church. Pagburnayan is a place where they use traditional methods for making pottery. Burnay is an earthenware jar crafted by potter’s hands using a traditional potter’s wheel. Fine sand is used as a tempering material and this is then fired at a high temperature in a brick and clay ground kiln. This makes the pot harder and more durable than the usual terra cotta used in pottery. The local bagoong (fish sauce), sugarcane vinegar, and basi wine ferment in burnay jars. There are 2 pottery making factories in Vigan, which are opposite each other. Philippine National Artist in Pottery, Fidel Go is the owner of one of the factories. Both factories welcome guests who want to try hands-on pottery making for free. They also sell souvenir items made of clay for a reasonable amount. The Syquia Mansion on Quirino Boulevard is now a museum filled with old furniture and exhibits dedicated to the life of Vigan native Elpidio Quirino. Quirino was the Philippines’ sixth president who was born in the nearby provincial jail, where his mother worked. He rose to political prominence after marrying into the fabulously wealthy Syquia family. Padre José Burgos National Museum. Built in 1788, this museum is in the ancestral home of Father José Burgos, one of the three martyr priests executed by the Spanish in 1872. It houses an extensive collection of Ilocano artefacts. It’s also home to a series of paintings by Don Esteban Villanueva, a famous local painter. The paintings depict the 1807 Basi Revolt. This occurred when the Philippines Spanish rulers banned the private manufacture of basi, a local alcoholic beverage made from sugarcane. Bantay Bell Tower, Vigan, Ilocos, Philippines. Pottery factory (Pagburnayan), Vigan, Ilocos, Philippines. Crisologo Museum, Vigan, Ilocos, Philippines. Old Town, Vigan, Ilocos, Philippines. Calle Cristologo, Vigan, Ilocos, Philippines. Vigan Cathedral , Ilocos, Philippines. Horse drawn Kalesas, Vigan, Ilocos, Philippines.